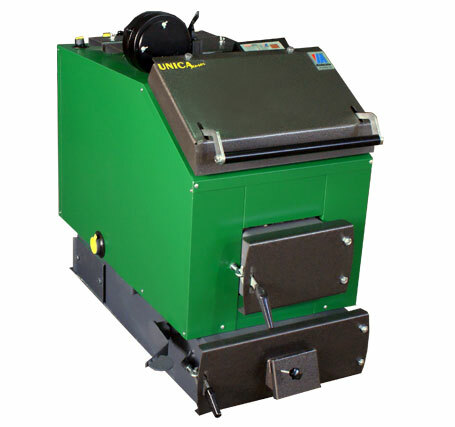 Unica Sensor is a low-temperature water boiler of steel construction for burning fuel of various type. A high level of efficiency and stable conditions of the burning process are guaranteed by a three-chamber exchanger. The boiler features a controller, a blower and distribution of primary and secondary air. These elements make the burning process to be controlled. The controller keeps record of water parameters in the boiler and on this basis sets properly the blower and circulating pumps. In Unica Sensor 40-60kW a sophisticated technologically controller with fuzzi logic EcoMax200W is used. All flaps have adjustable hinges and are closed with a pressure-down technique; outer surfaces are insulated with vermiculite material.